See simulation image at bottom. 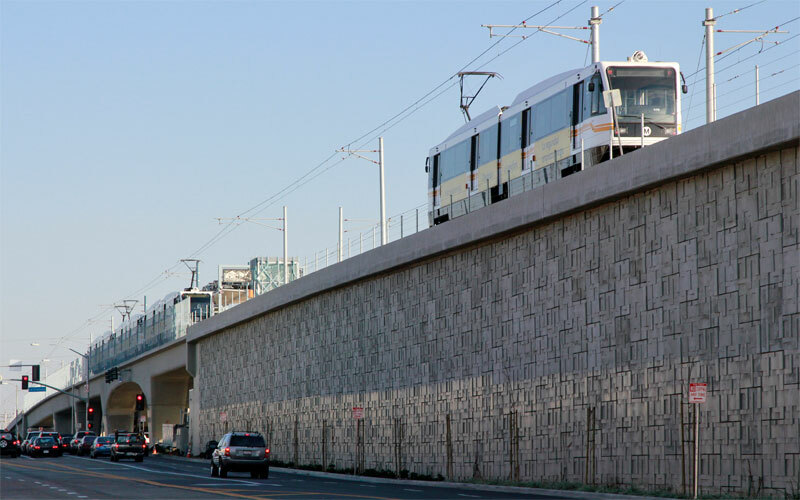 1/17/12 — Three-car and one-car test trains are stopped at La Cienega. 11/23/11 — Metro's The Source posted this video of riding from La Cienega to La Brea. 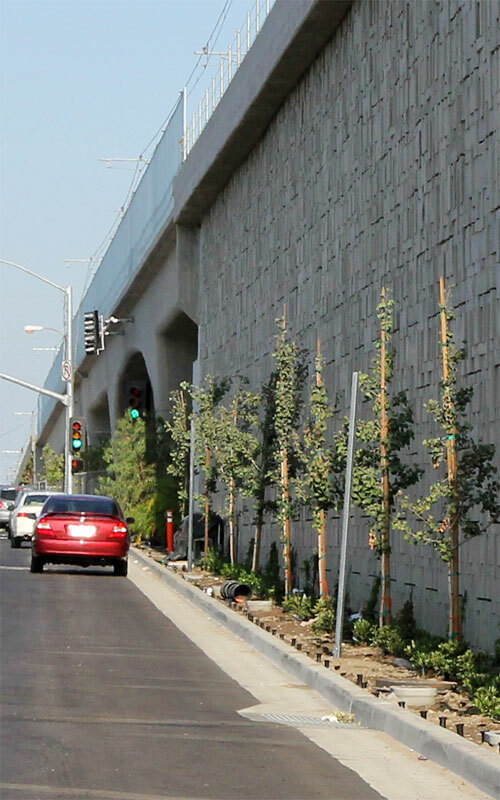 7/27/11 — Two kinds of trees and low plantings make the retaining wall west of La Cienega much greener. 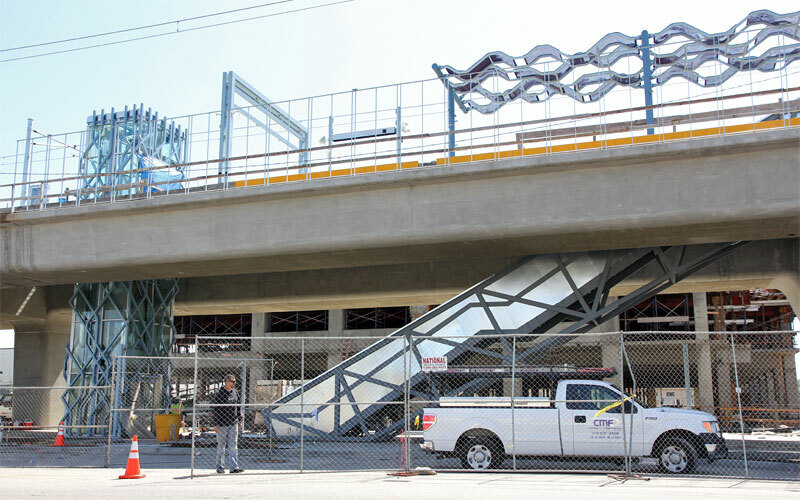 3/25/11 — This shows bridge side frames, elevator glass, canopy, and parking structure progress at La Cienega. Sheet metal has been newly installed on the east stairway. 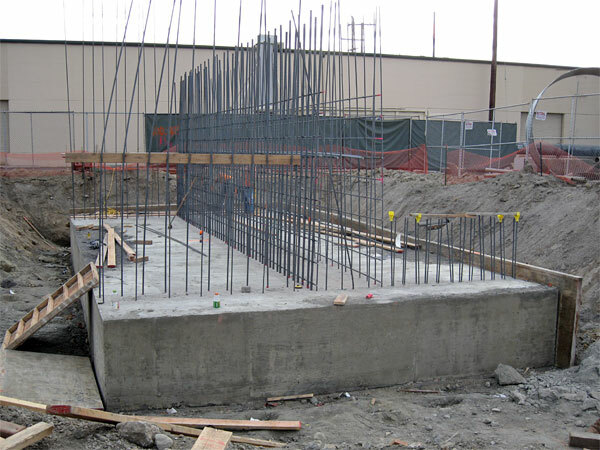 2/27/11 — Parking structure construction is proceeding. 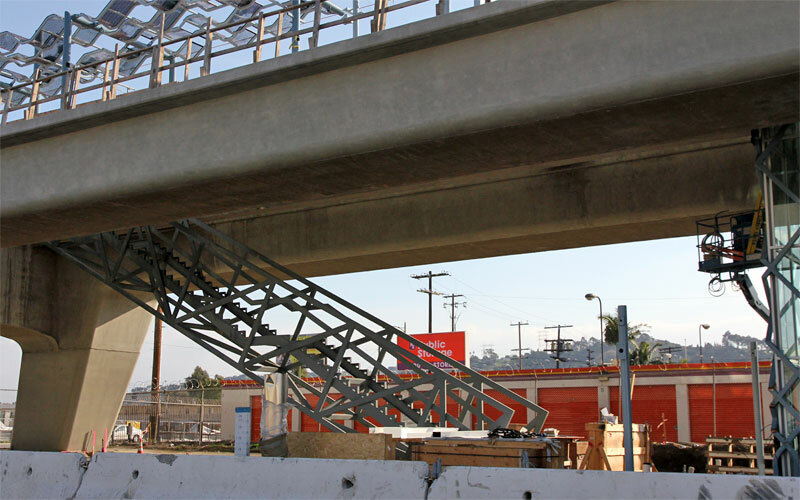 1/9/11 — The first stair frame at La Cienega is on the east side of the boulevard. 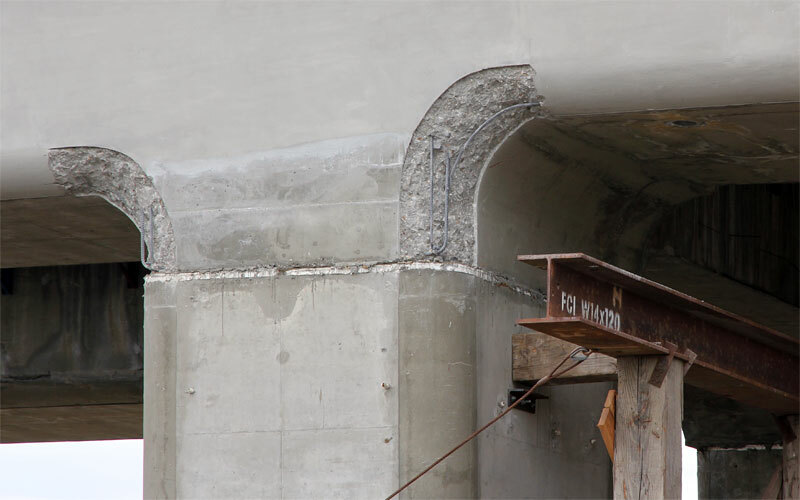 11/2/10 — The La Cienega parking structure's hole has been excavated, and work continues on the station platform. 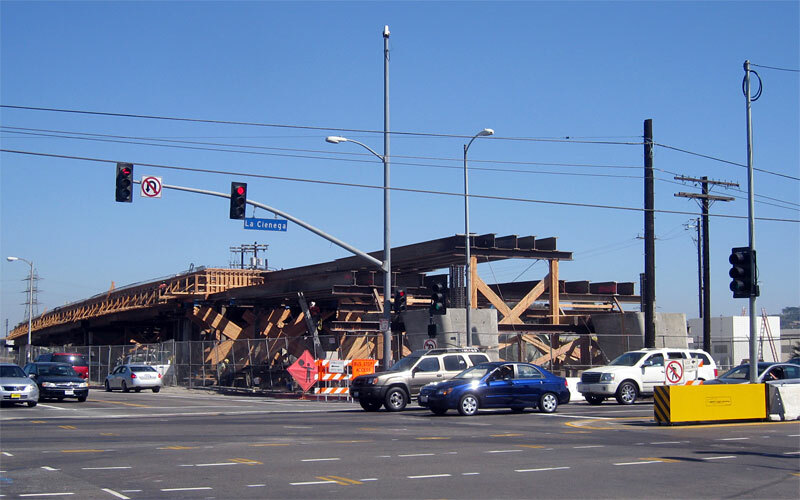 8/6/10 — An elevator shaft is being lifted into the La Cienega station. Also note the masking paper for spraying anti-graffitti coating on the MSE wall on the right. 7/20/10  New station canopies are shining colorfully in the sun. 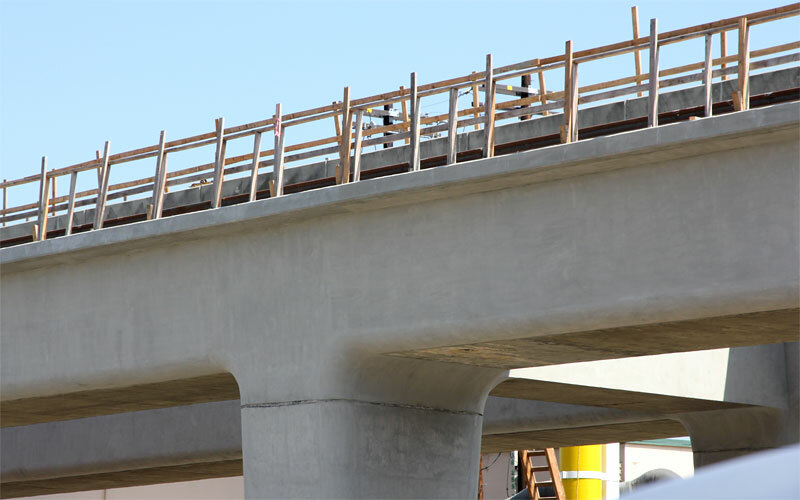 6/4/10  The concrete has been filled and ground to its final curve, and rails are visible on top of the bridge. 4/22/10  Excess concrete has been jackhammered off, to be patched and ground smooth for the final compound curves. 4/2/10  It's finally visible! 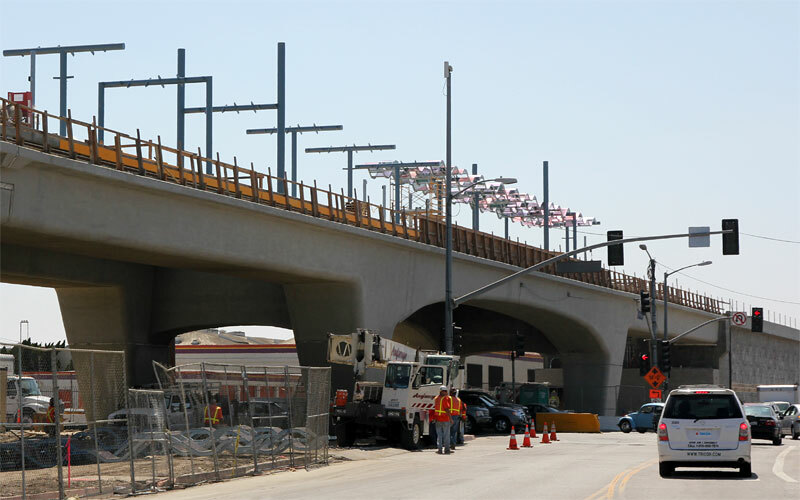 Here are two views of the La Cienega bridge with the falsework down (except for the higher station platform between spans). 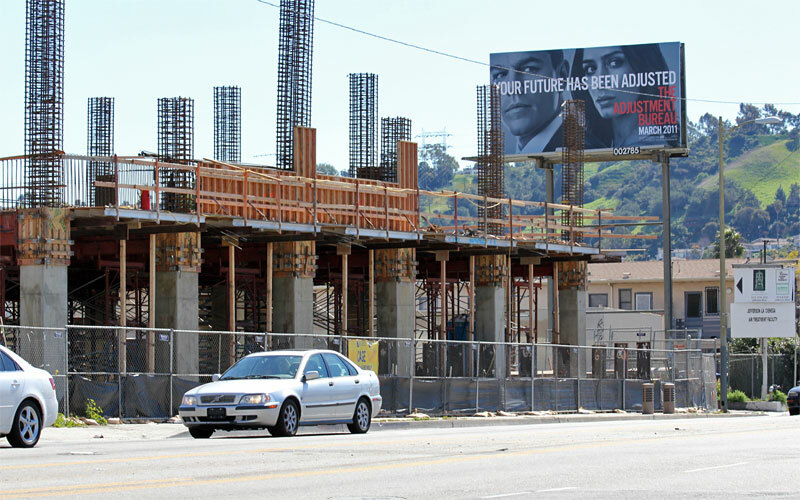 4/1/10  Another milestone: La Cienega Blvd. 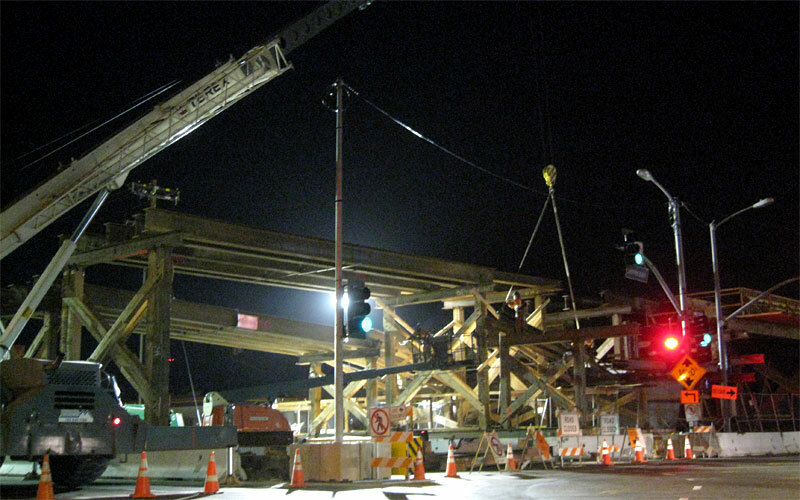 was closed tonight to remove the bridge falsework! A shower of wood is falling as a steel beam is pulled away. 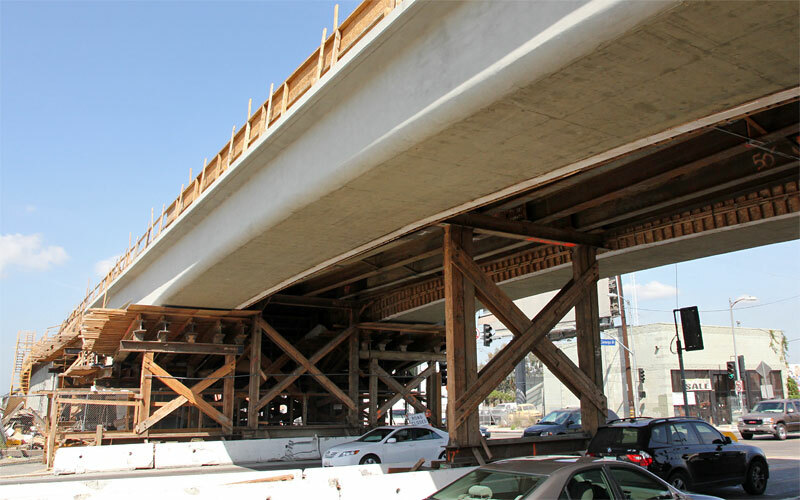 Below is a last view of the falsework with the full-height MSE wall to the right along Jefferson Blvd. 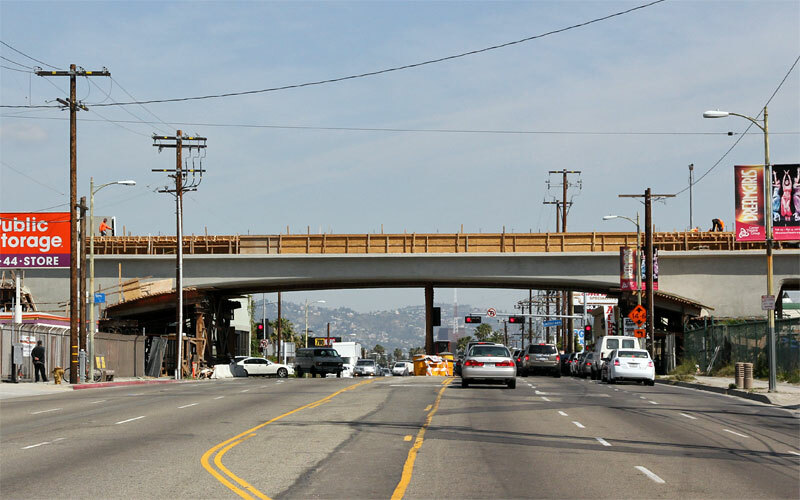 3/17/10  The retained fill section west of La Cienega is nearly complete. 2/23/10  Looking west along Jefferson west from La Cienega we see the nearly-completed La Cienega bridge and aerial station on the left, falsework for the Jefferson-Ballona Creek bridge in the distance on the right, and the MSE (Mechanically-Stabilized Earth) fill section rising in between. 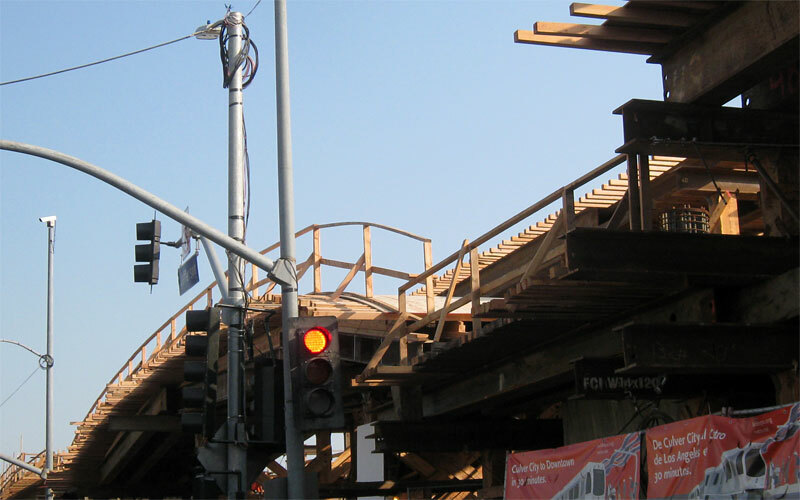 11/20/09  The curved plywood surface that will form the bottom of the bridge's concrete arch is in place. 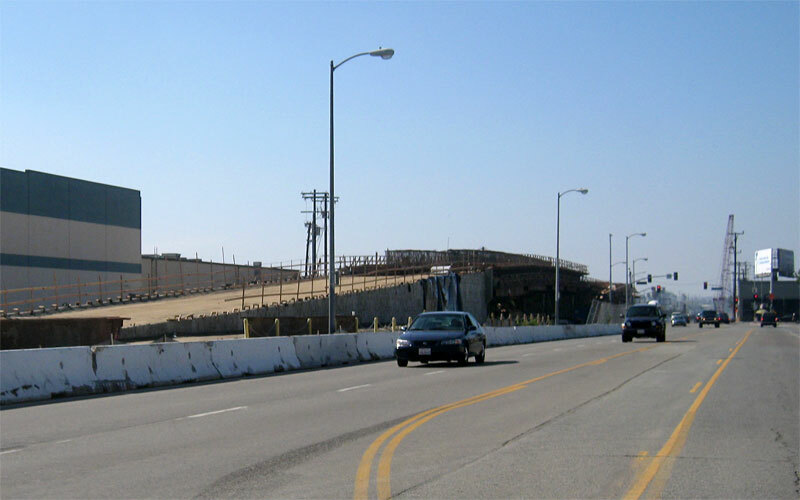 10/24/09  The MSE (Mechanically Stabilized Earth) ramp on the east side of the La Cienega is nearly complete. 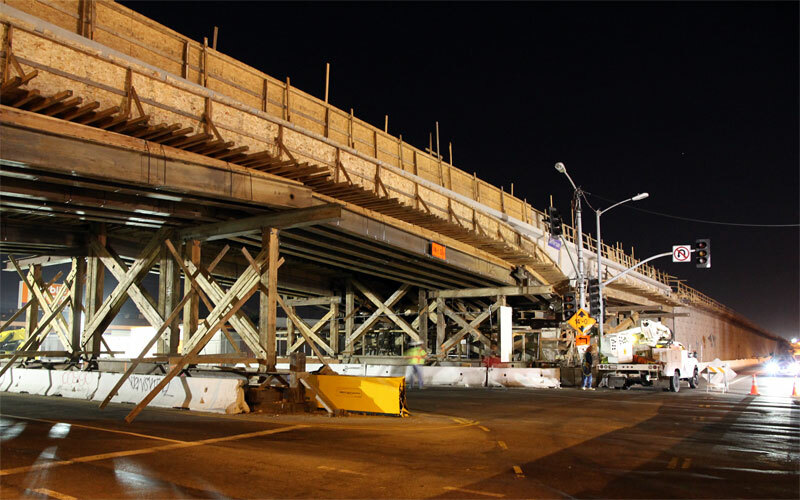 10/21/09  La Cienega was closed tonight for installation of more falsework steel. 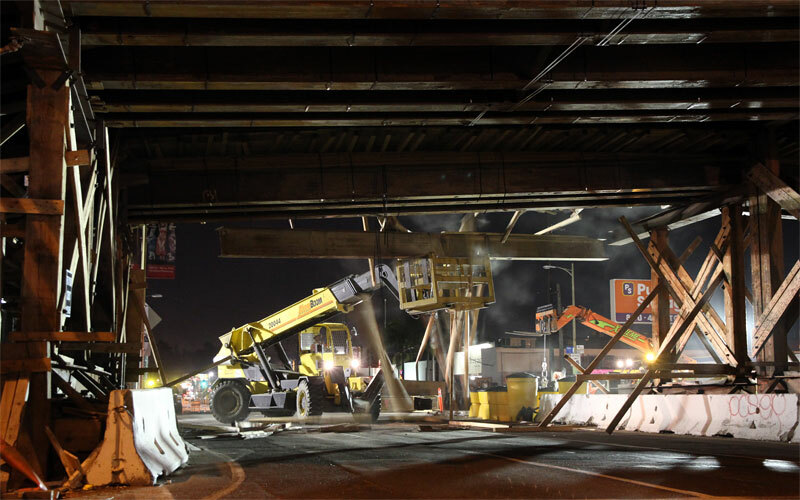 10/17/09  The first falsework beams above La Cienega were installed last night. 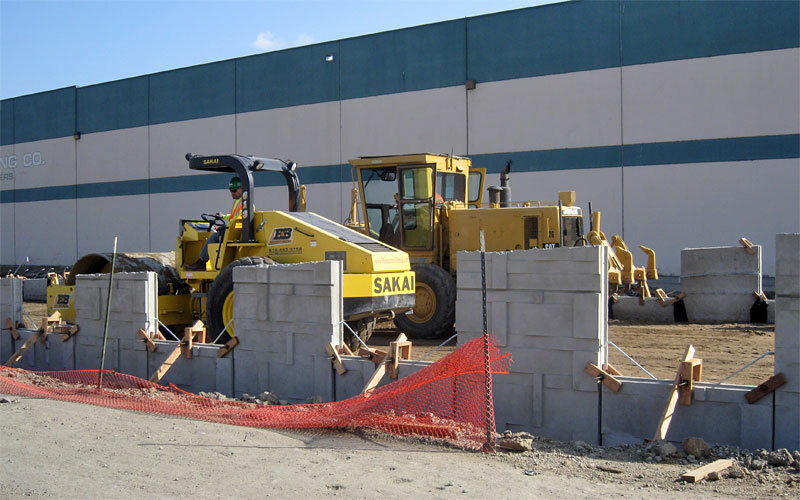 10/5/09  MSE (Mechanically Stabilized Earth) walls are beginning east of the La Cienega bridge. 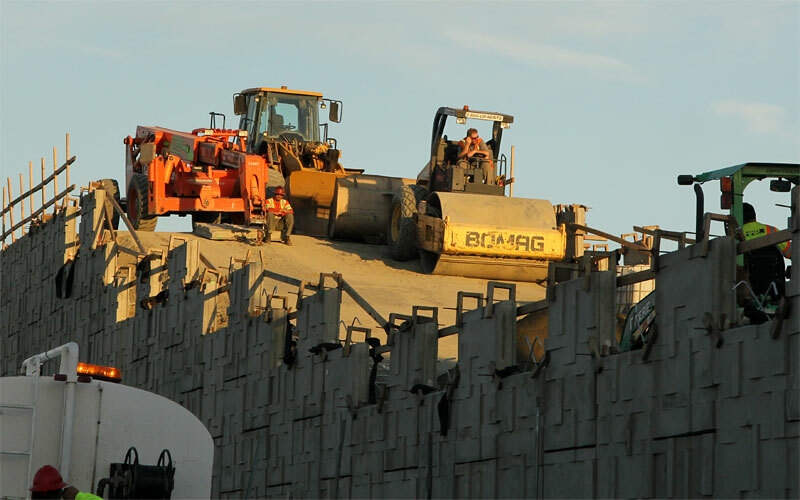 Earth is being graded and rolled between precast concrete panels. 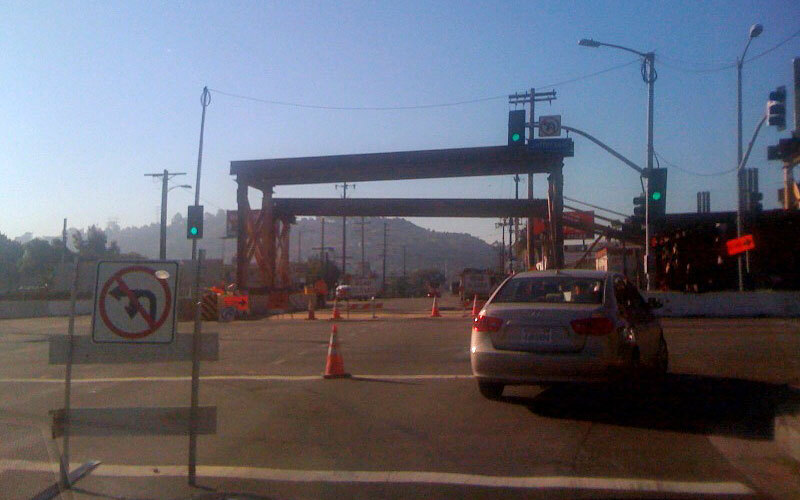 9/9/09  La Cienega falsework is getting close to spanning La Cienega. 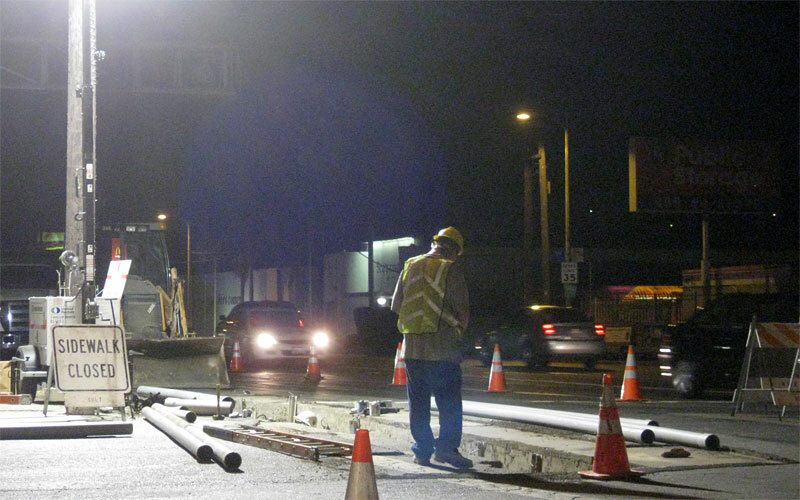 8/6/09  This night photo of putting the last of the La Cienega wires (cable TV / telephone; see 6/29/09) below ground also represents the huge amount of utility relocation construction, done largely at night, all along phase 1. 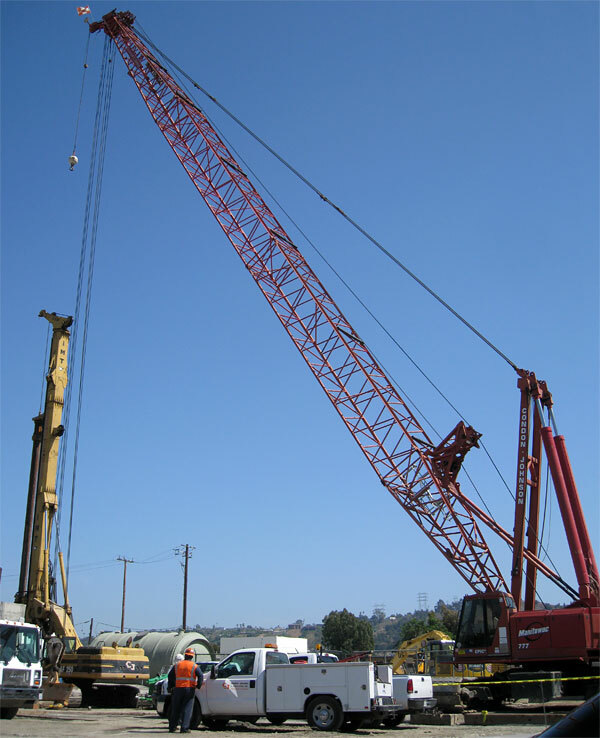 7/23/09  Above are the crane (right) and drill (left) used for the remaining footings on the east side of La Cienega, seen below behind the crane, one with its rebar cage installed and just filled with concrete. 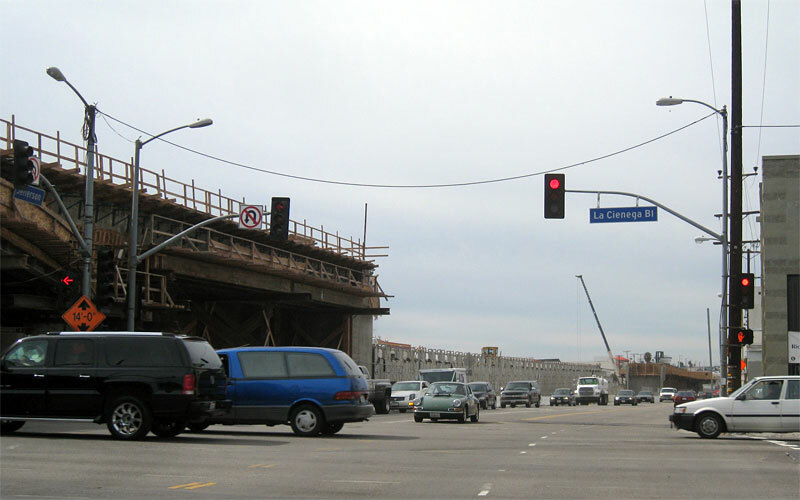 6/29/09  Most of the power lines at La Cienega are finally down; just one set of low wires on the east side remain. 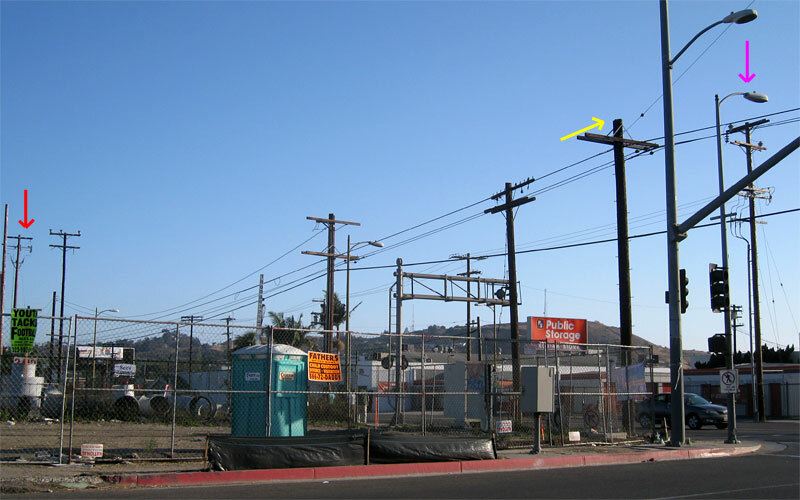 You can see the conduits taking the high wires down to the ground on the tall pole on the far left (red arrow). The next tall pole to its right no longer has wires. A closer tall pole has been cut off at the yellow arrow. 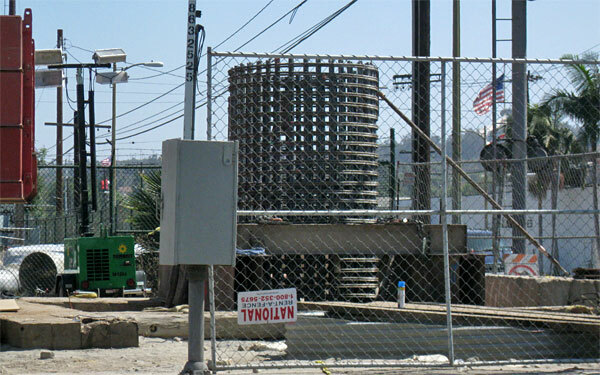 6/1/09  At La Cienega there are still four footings and columns that cannot be built until the power lines are underground. 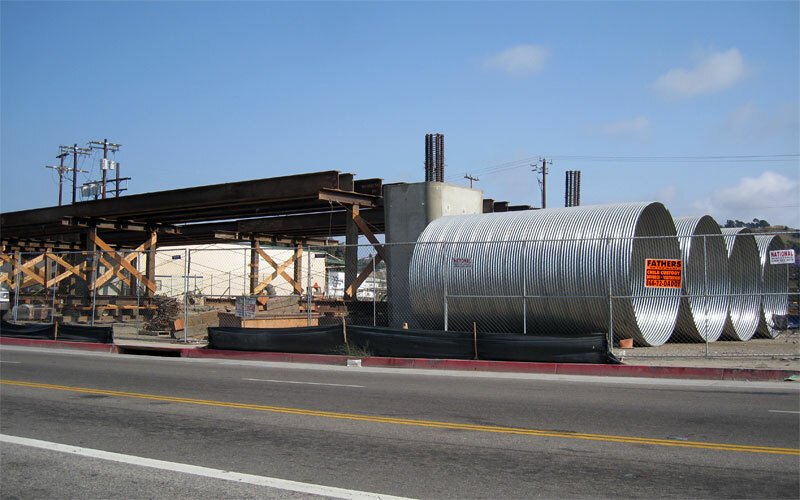 These four big steel cylinders will line the upper part of two footings on each side of La Cienega. 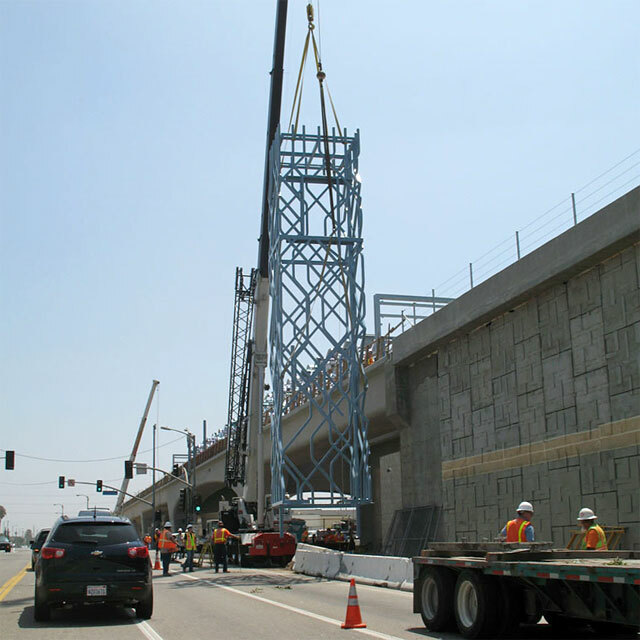 1/21/09  Bridge construction has begun at La Cienega by drilling huge holes in the ground for column footings, filling them with steel rebar cages and concrete, and casting columns above ground. Here are the eastern four columns east of La Cienega, looking east, with the far right one beginning form construction. 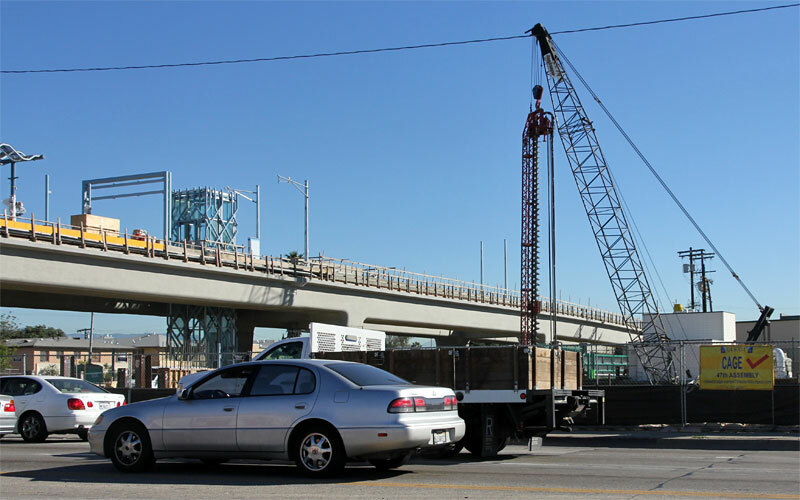 Drilling of the remaining two next to La Cienega appears to be waiting for wires to be removed. 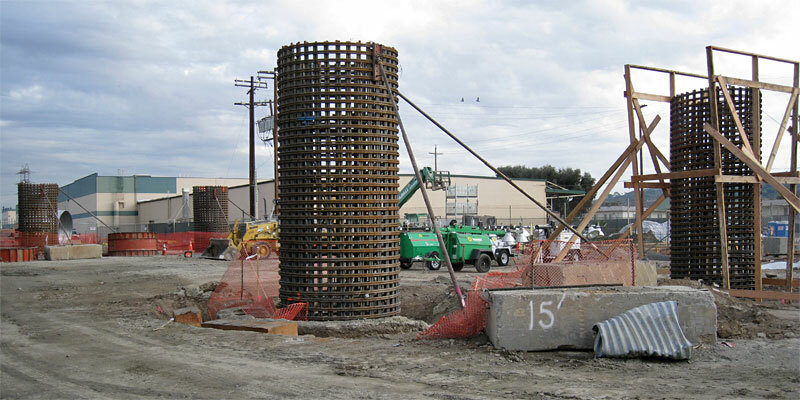 The east abutment at La Cienega has a cap cast over its footing piles (below). 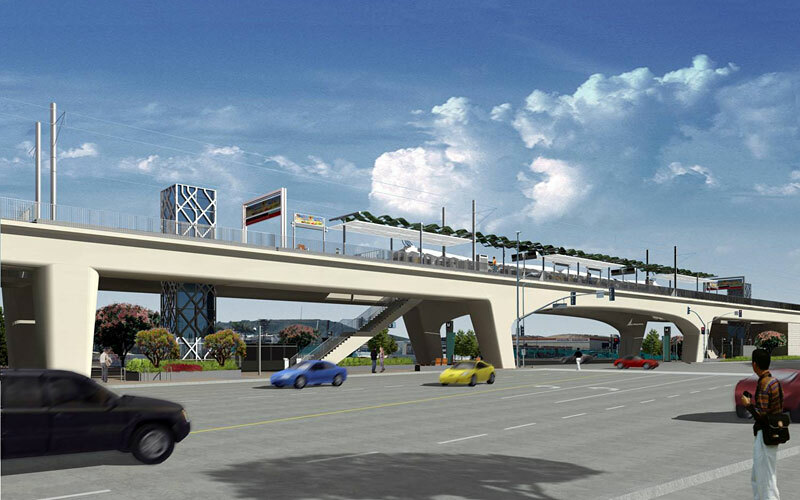 This Expo Authority image looking south at the La Cienega bridge and station shows the arched span and sloped columns reflecting the Urban Design Committee's requests.